Announcing! Thesis Theme Tools Skins! You might not have known it, but I have been writing skins for others for quite some time. Now I have decided to strike out on my own and offer them directly to you! 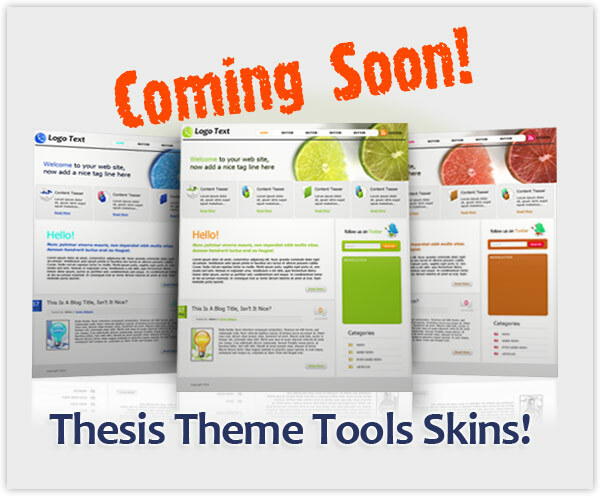 Thesis Theme Tools Skins will be launched on June 1, 2010. We will offer fresh new designs, innovative features, unheard-of user customizability, and rock-solid reliability and stability, all for reasonable prices. Tired of the same old ho-hum skin designs that the others tout? Envious of the snazzy non-Thesis themes available? Well, just wait until you see our designs! Created by the extremely talented Joel Thompson, our intent is to offer the best designs not only for Thesis, but to be found anywhere! But it’s not all just a pretty face. As you may expect from Thesis Theme Tools, the leader in advanced customizations, our skins have advanced features that focus on easy customization and maximum flexibility so you can make your skin just like you want it to be. Admin panels that let you upload and position your header, logo, footer graphics, and other graphics, as well as maintain tab panels, the footer, the copyright line, rotating galleries, and more! And some big surprises never before seen in Thesis skins! In the coming days, I will be previewing some of our new designs so you can get a taste of what is awaiting you on June 1st! So buckle your seatbelt! You are in for the ride of your life! I have been asked many times how to put your own images into a rotating gallery. Until now the only choice you had was the NextGEN plugin, which has limitations, is complicated to set up, and lacks some important features. Help is at hand! Enter the Rotating Image Gallery! The new article, “Tutorial: Rotating Image Gallery for Pages and Sidebars” shows you how to use this versatile and simple method of putting your own images into a gallery. A zip file with everything you need is available to make it easy for you to try it out for yourself! Can be placed anywhere there is a hook, and even in a widget. Any number of images of any size can be displayed. Images can be clickable links. Captions are optional, and can have links in them. The Image Gallery can have optional directional arrows and a pause button. Multiple galleries can be shown on the same page. Loops to the beginning after showing the last image, rather than stopping. You have complete control over slide speed, display time, captions, etc of every Image Gallery separately. You can configure fonts, borders, etc in the custom.css file. You can use the Image Gallery right out of the box! Included in the zip file are the images used in this tutorial. So why not show off all your great photos and give it a whirl? Many of my clients have asked for a way to put their own images into a rotating gallery. There is no plugin that is entirely suitable for this purpose that I know of. The closest is the NextGEN gallery plugin, but it has only rigidly defined ways to use it, is complicated to set up, and lacks some important features. What you need is a simple, easy to use, flexible image gallery that plays nice with Thesis. This tutorial shows you how to implement a Rotating Image Gallery that can be placed anywhere on the Thesis page that there is a hook — and even in a widget. Shown above and in the sidebar are two instances of the Image Gallery. Note that each has different speeds, and that there are arrows and a pause control on the widget but not in the larger gallery. The Rotating Image Gallery was developed from an idea at Catch My Fame. It is released under the Creative Commons Attribution-Share Alike 3.0 license, which means you are free to use and modify the code as long as you share it with others and attribute it to me. It is mandatory that you download the zip file for this tutorial! It has everything you need — all files, folders and images — in a single zip file. Setting up the Rotating Image Gallery without downloading the zip file is not described in this tutorial! You can download it by clicking here. How the Rotating Image Gallery works describes its operation and has all the code. Note that it does not include any of the images. Installing the Rotating Image Gallery contains instructions on how to install the files and folders found in the zip file only. Setting up the Rotating Image Gallery gives you a detailed, step-by-step guide to setting up the Image Gallery. Preparing your images for the Rotating Image Gallery provides useful information on the way to prepare your images for the best possible performance. Tips for using the Rotating Image Gallery lists helpful tips on how to get the most from your Image Gallery. for-custom_functions.php contains the functions that are put into the custom_functions.php file. The for-custom.css file has two selectors that are placed in the custom.css file. for-widget.php has only one line of code, which is put into a text widget if you are using the widget version of the Image Gallery. This program actually runs the Rotating Image Gallery. All the other files are necessary, but serve to support it. I modified it so that it would work with Thesis and the Image Gallery. //do not change the following settings! <img alt="bluebird in the snow"
This file has only two selectors: one for the page/post version of the Rotating Image Gallery, and one for the widget version. These selectors are put into the custom.css file. This file is needed only if you are using the widget version of the Rotating Image Gallery. It contains one line of code, which is inserted into a text widget. Copy the rotating_images folder in the zip file to your /custom folder. Insert the functions found in the for-custom_functions.php file into your custom_functions.php file. Insert the selectors found in the for-custom.css file into your custom.css file. 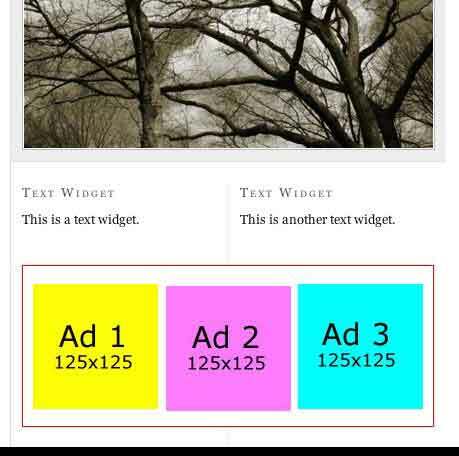 If you are using the Rotating Image Gallery in a widget there are two additional steps, described in the next section. The /arrows folder containing all the buttons and arrows used. A /gallery folder for your images. It already has all the images used this tutorial in it. Feel free to delete them and replace them with your own images. All you have to do is to copy the entire /rotating_images folder to your /custom folder. Do not copy individual files! Really, that’s all there is to this step! 1. You must copy the rotating_images_foot function to custom_functions.php! It is used for both versions of the Image Gallery. 2. Copy the image_gallery_page_setup function if you will be using the Rotating Image Gallery for a post or a page. 3. 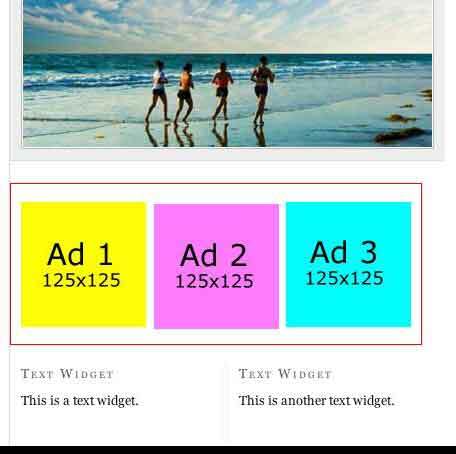 Copy the image_gallery_widget_setup function if you will be using the Image Gallery in a widget. 1. Copy the image_gallery_page selector if you are using the post/page version. 2. Copy the image_gallery_widget selector if you are using the widget version. 3. It will not hurt anything if you copy both selectors to your custom.css file. Widgets do not execute PHP code without a little help from a plugin. I recommend the Exec-PHP plugin, but there are a few others that do the same thing. All you have to do is upload and activate it. The settings have only one check box, which must be checked. All these steps will be covered in detail in the following sections. Incidentally, the settings in the code listed above and the files in the zip file are the ones used in this tutorial. 1. Find the rotating_images_foot function in the provided code for the custom_functions.php file. 2. Find the “Configure rotating gallery…” comment for either the widget version or the page/post version. transitionSpeed is how fast the images move when changing from one to the next. If you set this too fast, images with a large file size may hesitate or stutter. displayTime is how long the image is displayed. Setting it to a larger number makes the image stay visible longer. textholderHeight determines how tall the caption box is. The number is a fraction of the height of the image. You may have to experiment with this number, especially if you have long captions that take two or more lines. displayProgressBar You can choose to display a progress bar at the bottom of the image that shows how much longer the image has to display. It starts out all the way across the bottom and gets shorter as the view time decreases. 4. Do not change the section for the URLs unless you want to remove the arrows and pause buttons. That subject is covered in the following section. The forward and backward buttons, pause button, and the little button and arrows that come up when the Image Gallery is paused can be removed so that they cannot be used. All you have to do is add “-clear” to the name of the image URL in the rotating_images_foot function in the custom_functions.php file. Note that the large Image Gallery at the top of the page has no arrows, pause button or other buttons and arrows, while the widget has all of them. This setting is the same for both the page/post version of the Rotating Image Gallery and the widget version. Making the settings is not hard once you get the hang of it, though it may look complicated at first glance. 1. Select the right function to work on. If setting up a page/post Image Gallery, look for the image_gallery_page_setup function in the “SET UP ROTATING IMAGE GALLERY FOR A PAGE OR POST” section of the code provided for the custom_functions.php file. If setting up the widget version, look for the image_gallery_widget_setup function under the “SET UP ROTATING IMAGE GALLERY FOR A WIDGET” section. ALT-TITLE is a short description of the image. It is optional but highly recommended that you take the time to enter this information. IMAGE-NAME is the file name of the image, for example “pickles.jpg”. Do not change any other part of the URL! It is set up so that it will find your images if you have put them in the /rotating_images/gallery folder (see below). WIDTH and HEIGHT must be entered for each image. It seems redundant, but that’s the way it is! TEXT-IN-CAPTION is the text shown in the caption under the image. If you make the caption long enough, it will wrap to two or more lines. If this happens, you will have to adjust the textholderHeight property, as described above. LINK-URL is the URL of the site you want to link to. You must put in the full URL of the site, or you will get a 404 page! LINK-DESCRIPTION are the words in the caption that will be linked and that the visitor will click on. There are two selectors provided for your custom.css file: one for widgets and one for the page/post version. They are identical except for their names. The selectors are heavily commented and contain only standard CSS properties. I won’t repeat the comments in the code so as not to bore you. I have put in a few properties for fonts, but you can add whatever other properties you want. You may use the properties as-is, except you must set the height and width properties the same as the images that you entered above under Step 2 above! If you don’t your Image Gallery probably won’t work, or will appear as a box with scroll bars at the sides and bottom. All images within a Rotating Image Gallery must be the same size. If they are not, your Image Gallery will at best look odd, or at worst not work at all. There are many programs available that can resize images, some of them free. If putting the Image Gallery into the content column, be sure not to exceed the width you set in the Thesis Design Options. Likewise, if putting it into a widget, check the sidebar size to make sure your images are not too wide. Images that have file sizes that are too large may cause stuttering or hesitation as they move into the image box. Make sure your images’ size is optimized for the web. There are many programs that will optimize them without significantly degrading their quality. Note that you will put your own images into the /rotating_images/gallery folder. If you put them anywhere else they won’t be found! 1. Setting the transition speed too fast can result in stuttering or hesitation as the image changes. Reset the transitionSpeed property in the rotating_images_foot function in the custom_functions.php file to a higher number. 2. Images that have file sizes that are too large may cause stuttering or hesitation, too. Make sure your images’ size is optimized for the web. There are many programs that will optimize them, many for free. 3. Captions that are too long will wrap to two or more lines. If these additional lines are not showing completely, change the textholderHeight property in the rotating_images_foot function in the custom_functions.php file to a larger value. I hope you find this tutorial easy to follow, and that you give the Rotating Image Gallery a try. Be sure to download the zip file! As always, your comments are welcome. If you want to contact me directly by email, please click the “Contact” button in the menu. We often don’t think of the possibilities of two-column sidebar boxes because the multimedia box is so predominant. However, Thesis makes it easy to build and use sidebar boxes that span both columns of the sidebars. They can be placed above or below the multimedia box or at other locations along the sidebar — even at the bottom. These boxes might be used for an opt-in box form, advertisements, pictures of Spot, a flash movie, or almost anything you might dream up to put in them. In fact, many people use them instead of the multimedia box because of their flexibility. A new article, “How to Build Two-Column Sidebar Boxes,” shows you how simple it is to build these sidebar boxes, and provides illustrations of where they can be located on the sidebar. It is an easy-to-follow tutorial that will leave you itching to try it! Later today I will publish two more articles for newbies (and oldies, too!) about basic CSS and PHP syntax and how they are used in the custom.css and custom_functions.php file. Many Thesis users want to use boxes spanning two sidebars for announcements, images, ads, or other purposes. Requests for instructions for making and using sidebar boxes are frequent on the DIYthemes Forums. Sidebar boxes are easy to build and use, and this article gives you all you need to get started. The illustrations show how using different hooks places the sidebar box in different locations along the sidebar. Put the following code into your custom.css file. The code’s comments tell you how to set up the box. It is very important that the width of your sidebar box not exceed the sum of your sidebar column widths. If it does, the best that will happen is that it will hang over into the border around your page — and it can completely mess up your sidebars if very much wider than it should be! The basic job of the following function is to wrap your text, images, or ads in a div whose id calls the box-building code you put in custom.css — think of it as a container for your box. Within the div is the code for the contents of the box. Then after the function, the “add_action” statement hooks the box where you want it to go. Here is the basic function to put into your custom_functions.php file, along with all the possible “add_action” statements for the sidebars. The “add_action” statements will be discussed individually below. You can’t help but have noticed that there are 5 “add_action” statements. Each one places the sidebar box in a different spot along the sidebars. All of the possible sidebar hooks are listed for your convenience. Important! You can only use one “add_action” statement at a time, so delete or comment out the ones you will not be using! The first add_action statement uses the hook “thesis_hook_before_sidebars”, which puts the sidebar box above the sidebars and the multimedia box, if it is present. The second statement uses the “thesis_hook_after_multimedia_box” hook, which puts the sidebar box below the multimedia box if it is present, and above any widgets in either sidebar. The third statement uses the “thesis_hook_after_sidebars” hook, and puts the box below the last widget in the sidebars — that is, if it can be made to work! More often than not, it places the box in the middle of your widgets! The better solution is to determine which of your sidebars is longer, and use the “add_action” statement for that sidebar to place the box below the sidebars, as in Figure 3. Though short, this article has shown you the principles of how to build a sidebar box, how a function wraps around the div that calls the box, and how to put the box where you want it. I hope you find this article useful on your blog! Remember that your comments are always welcome, and that you can email me directly using the “Contact” button in the menu. One of the things that most Thesis newbies want to know right away is how to put an image into a sidebar. It is an easy task that takes only a few minutes. Following is a step-by-step guide to putting both a non-clickable and a clickable image into a sidebar. Images that are too big will overflow the boundaries of the sidebar. Size your image to fit. 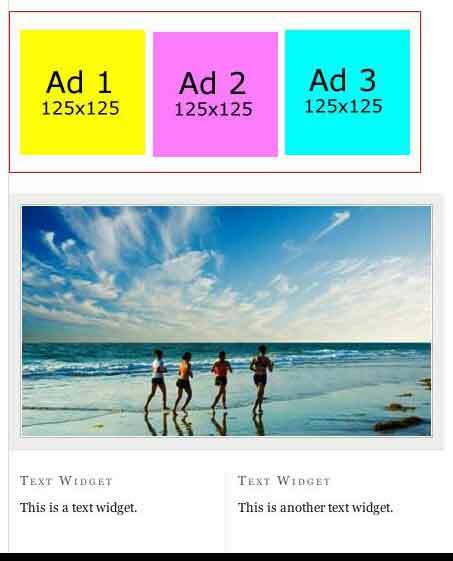 The maximum width will be the width of the sidebar you defined in Design Options. It’s a good idea to make the width a little smaller. Images will be centered in the sidebar. 1. From your Admin page go to Appearance > Widgets. 2. Look for “Text” in the available widgets on the left, then drag it to your sidebar. Drag and drop the new text widget into the desired location. 3. Click the arrow to the right in the text widget bar to open it, if necessary. 4. Enter a title if you want. This is for when you only want a non-clickable image in the sidebar, like a cute picture of your dog. 3. “DESCRIPTION-OF-IMAGE’ is a description of the image. It’s good SEO practice to provide a description. 4. Save the widget, then refresh your blog page to see your new widget. This is for when you want a clickable image in the sidebar. When the image is clicked, it takes the user to a URL of your choice. You would use this for RSS buttons or ads, for example. 2. “CLICKABLE-LINK” is the URL you want the user to be taken to when they click the image. 3. “FULL-PATH-TO-IMAGE” is the URL of the image. As discussed above, it requires the full path to the image, not a relative path. 4. “DESCRIPTION-OF-IMAGE’ is a description of the image. It’s good SEO practice to provide a description, and it helps you remember what the image is. 5. Save the widget, then refresh your blog page to see your new widget. I hope this short tutorial has been helpful to you. As you see, working with code is not hard, and it’s mostly just cut-and-paste. As always, your comments are welcome. If you want to email me directly, click the “Contact” button in the button bar.